The Julijana Restaurant has a charming terrace and is situated on the most beautiful part of Lake Bled. It can seat 20 guests in the dining room and just as many on the terrace. Dishes are adapted to reflect the season. The head chef will be happy to help you chose from the selection of delights on offer. The feel of nearly 100 years ago, the view of the lake and the intimate atmosphere that develops between up to 20 guests and the serving staff make this Bled restaurant truly unique. Chef Simon Bertoncelj changes the menu daily so that it reflects the season. Using seasonal ingredients, he further enriches the flavours of already top level dishes. 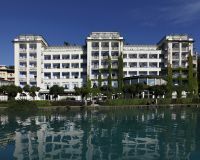 The Julijana Restaurant is part of the most elegant hotel at Bled – the Grand Hotel Toplice where their centuries-long mission has been making sure that your time in paradise runs a bit more slowly. The Julijana Restaurant serves the most typical dessert of Bled – the original Bled cream cake made to the original recipe. The chef of the Julijana Restaurant shares his culinary curiosity with his guests at unique culinary events. One such event is the Chef's Table, where your table is set in the very kitchen of the Grand Hotel Toplice! If you descend the wide stairway of the most elegant Bled hotel – the Grand Hotel Toplice – towards the most beautiful part of the Bled shore, you will enter the intimate world of the Julijana Restaurant. This boutique restaurant seats just over 20 guests. With its intimate atmosphere, magnificent view of the lake and seasonal gourmet delights, it attracts people who like to eat with all their senses. 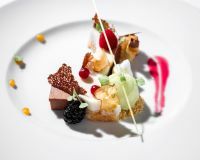 The acclaimed chef Simon Bertoncelj creates fresh, season-specific menus daily. He sparks the guests’ culinary curiosity with a daily special and his culinary events. Visit us and turn a new corner on your culinary journey! 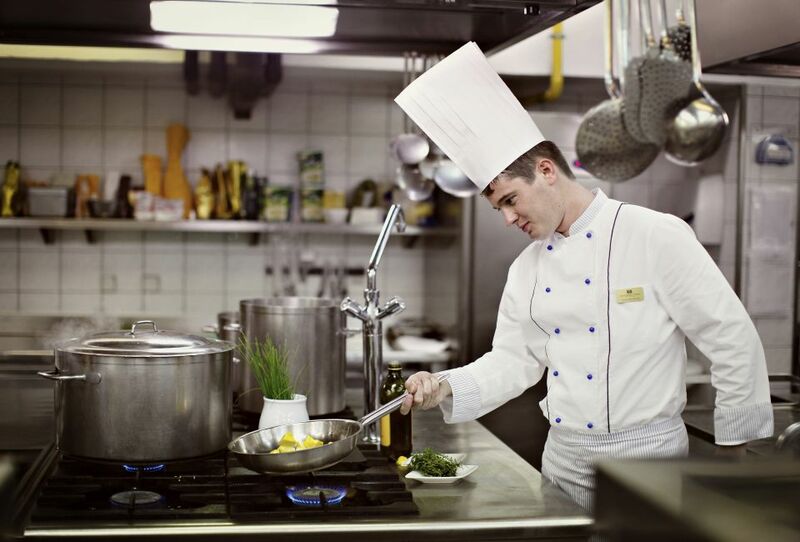 Chef Bertoncelj is recognised for the richness of ingredients and flavours that he combines into sophisticated dishes. His creations reflect the extensive knowledge he gained at the restaurants of acclaimed chefs: the excellent Gordon Ramsay, the French chef Marc Meurini in Lille who boasts two Michelin stars and the Esszimmer BMW Welt restaurant in Munich that was awarded one Michelin star. He spent time with the Austrian chef, Bobby Bräuer, who boasts three chef's hats and 18 points according to Gault Millau, while he himself hosted the renowned Italian one Michelin star chef, Gianni Tabarini from the La Présef restaurant (La Fiorida), at the Four Hands Dinner event held at the restaurant of Grand Hotel Toplice. The Julijana Restaurant is closed when the Grand Hotel Toplice is closed.